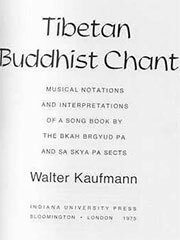 A Buddhist chant is a form of musical verse or incantation, in some ways analogous to Hindu or Christian religious recitations. They exist in just about every part of the Buddhist world, from the Wats in Thailand to the Lamaist temples of India (re: Tibetan Government in Exile). Almost every Buddhist school has some tradition of chanting associated with it, regardless of being Theravada or Mahayana. In Buddhism, chanting is the traditional means of preparing the mind for Meditation; especially as part of Formal Practice (in a monastic context). It is also used as an invocative ritual in order to set one’s mind on a deity, Tantric ceremony, mandala, or particular concept one wishes to further in themselves. In particular, the chant Om Mani Padme Hum is very popular around the world as both a praise of peace and the primary mantra of Avalokitesvara. Other popular chants include those of Tara, Bhaisajyaguru, and Amitabha. Chanting plays a more substantial role in Mahayana and Vajrayana Buddhism than in Theravada, owing largely to the expansive and religious nature of the former pair. This does not mean chanting does not occur in Theravada practise. Rather most chanting concerns the Suttas (Skt: Sutras), while the Mahayana schools include sutras, prayers, and Tantric invocations, the latter two of which are not common (if present at all) amongst Theravadins. There are also a number of New Age and experimental schools related to Buddhist thought which practise chanting, some with understanding of the words, others merely based on repetition. A large number of these schools tend to be syncretic and incorporate Hindu japa and other such traditions alongside the Buddhist influences. While not strictly a variation of Buddhist chanting in itself, Japanese Shigin (詩吟) is a form of chanted poetry that reflects several principles of Zen Buddhism. It is sung in the seiza position, and participants are encouraged to sing from the gut — the Zen locus of power. Shigin and related practices are often sung at Buddhist ceremonies and quasi-religious gatherings in Japan.